Too Hot to Handle (1938). 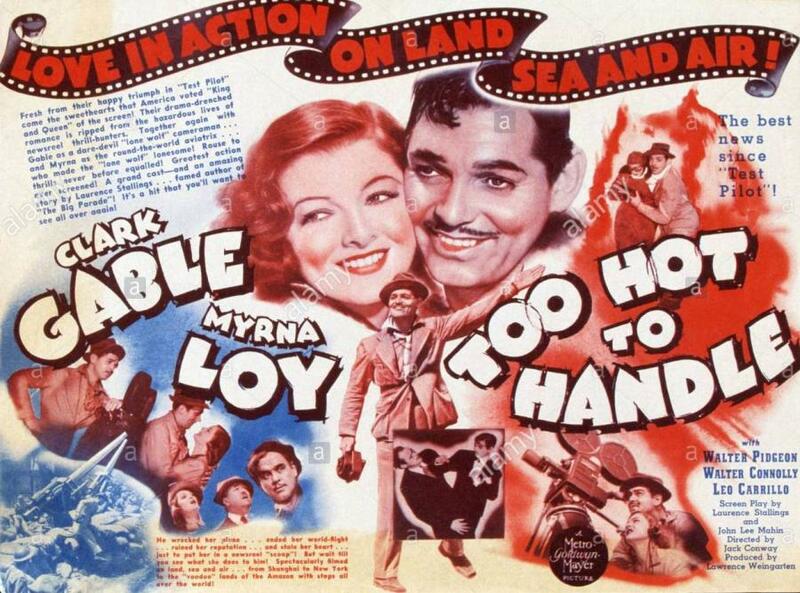 Starring Clark Gable, Myrna Loy and Walter Pidgeon. Ace newsreel cameramen Chris Hunter (Clark Gable) and Bill Dennis (Walter Pidgeon) cover the globe, cracking wise and trying to scoop each other on the biggest stories in the hottest hot spots. But they’re rivals in more than work. They both love a fearless aviatrix (Myrna Loy) who may be Too Hot to Handle. The charisma is irristable. The story races from China to New York to South American Jungles. Adventure, Comedy Drama. Not Rated, 105 minutes, Black & White.